SGM family includes water thermostats with circulatory pump, and were planned for laboratory use (operating between +20 °C and +45 °C). These apparatus are produced with volumes of 10 and 20 liters and provided for every equipment or systems manufactured by Experiment (e.g. 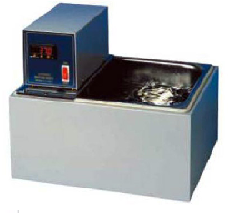 : isolated organ baths, Langendorff apparatuses moreover, for any other laboratory systems, which need to be thermostated in these temperature range). The apparatus is made of stainless; its parts (heat- control, circulatory pump, water tank, etc.) are easily separable and this facilities cleaning and service. A heating reservoir may be added. 6. Calibration and Protocol Documentation. 7. Three models according to bath volume (5L, 10L, 20L). 8. Temperature range from ambient +5 c above to 100c. 9. PID microprocessor controller (touch pad type) achieves accurate temperature control. 10. Memory to store three temperature setting and single button to activate required set. SGM LAB SOLUTIONS PVT. LTD.
© 2013 SGM Lab Solutions by Unicode Solutions Techno Pvt. Ltd. Thank you for taking the time to get to know us better. Kindly submit your requirments. Our Sales Team will contact you at earliest. The image text does not match.